The first Adelaide International, Apart we are together stretches out across Adelaide. Clustered around the west end, it reaches out arms to the city and the east in a rudimentary map, a kind of pseudopod unity. But maps are misleading. Too simplistic, flattening space into glyphs, they impose a false unity and the works of Apart, we are together are altogether more various and elusive than this. Invoking maps at this historical moment where the world is imaged, linked and geo tagged inevitably evokes the complex of activities, forces and circumstances that is globalisation. Becoming the frame through which everything is read it’s evident that one of globalisation’s most outstanding successes so far is the creation of its own mythology. One of ubiquity, inevitability and irresistible force. Like all good ideologies, globalisation works in the imaginary and its mythology is at once dense, rich with data and convincing colour and movement and at the same time one of immateriality. As Saskia Sassen writes it’s one characterised by ‘hyper mobility and dematerialisation’ . A dematerialisation enabled by communication technologies that, disposing of place and space and divorcing the material effects of globalisation from their source, feeds the myth of inevitability. Invisible and literally ungraspable globalisation’s seamless surfaces seem to leave no handhold for resistance. Faced with this sleek irresistibility resistance becomes necessarily more nimble, seeking out in Stengers words, ‘the interstices’ where life and hope ‘is always lurking in what escapes description’ . It is precisely in these chinks and gaps that the artists of Apart, we are together work. These are regions of relations and affect, between people, space, action and time. It is in the instability of relations, in their making and remaking that the possibility of resistance lies. These are potent spaces where what has been dissolved is rematerialised bringing it back into contention. Taking as its curatorial touchstone the phrase from the Mallarme poem, Apart we are together binds the exhibition around this theme of the ‘impulse to connect with an object, person, group, place or state of being’ . But I would suggest that the works here go further, that they are more mischievously subversive seeking to undo more than surface.’ Possibility’ Stengers writes is ‘what cannot be calculated a priori because it implies the fact that the very description of the system itself can change’ . Working with and through incompleteness, montage, juxtaposition and ambiguity, using always the ephemeral and partial, these artists incorporate this assumption, so that what is lived out in their works is this larger field, the possibility of possibility. 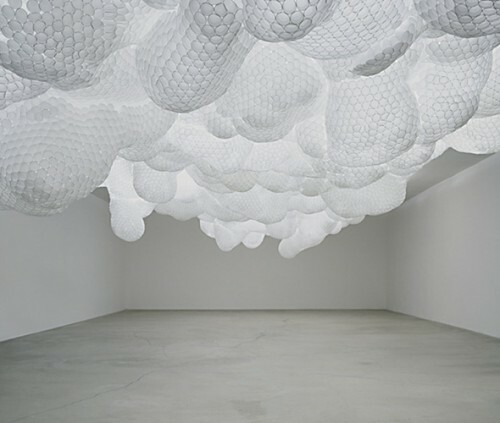 Tara Donovan’s Untitled (Styrofoam cups) (2003/2010) looses the possibilities of the simple relations of repetition and accumulation in the bonding together of thousands of white Styrofoam coffee cups transforming them into an alluring billowing entity more fluid dynamics than cloud. 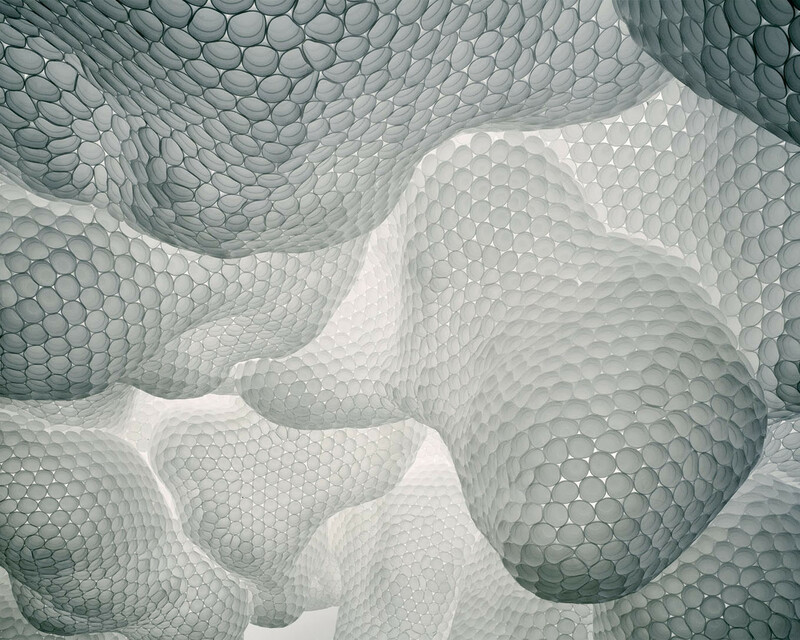 With the eye constantly flickering between the single thing and the mass, Untitled seems to hover in this state of simultaneous connection and disconnection speaking very exactly of these relations. The yearning for authentic connection, for love even, of Mallarme’s poem appears to be the uncomplicated motivation of Donghee Koo’s film The static electricity of cats cradle (2007). Like the game, a young man connects himself and a sleeping young woman both sweetly pyjama clad, to harnesses and ropes. Launching himself above her they go through a stuttering dance of coming together and apart with the young woman awaking as they finally embrace. As they hold to each other, the camera pulls back showing a controlling puppeteer who switches off the show leaving only a sparkling firecracker hoop. Like Donovan’s coffee cups there’s a complicated tension in this coming together but at the same time it’s too charming to be an entirely cynical view of love as construct with the puppeteers impotence at the end letting us hope for more. The immateriality of technology erases the space of encounter and so, for many of these artists reinstating the space is as vital as the event. This place making propels the work of the Orta’s, Li Mu, Iman Issa, Raeda Saadeh and Apichatpong Weerasethakul as they recover physical, psychic and social spaces countering ubiquity, monumentality and inevitability with the unstable, unique and temporary. Iman Issa’s photographic series Making Places (2007) shows her emptying a bucket into a full fountain, shining a torch down a lit tunnel and throwing balls at the blank faces of skyscrapers, small actions that seem nonsensical against the monumentality of their surrounds. Rather than quixotic acts, the artist is deftly triangulating space, event and time transforming undefined space into a place populated with an event and a history. Showing us how it’s done, these actions unravel the grandiose pretensions of the city and the epic symbolism of capital. There is a similar initial absurdity about Raeda Saadeh’s two screen video installationVacuum (2007) as she ‘cleans’ a desert mountain disappearing off the screen at one point to pop up on the other screen much further down the mountain. As a Palestinian artist cleaning a mountain near Jericho, Vacuum could be read as a commentary on dispossession but the Sisyphean perseverance of her actions and the odd verisimilitude afforded by the impossibly long extension cord makes it much more uncertain. Vacuum might be about technology, nature and waste, the conflicts over the ‘empty’ land of Palestine or the meaninglessness of daily work but it is the sheer persistence of her body in this place that endures. Apichatpong Weerasethakul’s video pieceMorakot (Emerald) (2007) is a gentle and hopeful work that lovingly rematerialises the spaces of reverie. As the camera tracks through an abandoned hotel, clouds of floating particles (dust, snow or ash?) multiply and luminesce, green, pink and blue as the speakers remember their lives. As a poem written to a lover, dreams of home and soldiers are recalled, the particles thicken and pull us into rooms where sleeping faces can now be glimpsed on the pillows. The urge to capture everything before it fades, both memory and material is held onto and then gently released. As Jorge and Lucy Orta’s collaborative enterprise is now so expansive as to be a global network of its own, the works here can really only be intimations of larger projects yet all have the reclamation of social space and the creation of sociability at their core. The Nexus architecture project (2007-10) a series of increasingly complicated ‘safety’ harnesses overloaded with clips, buckles, loops and reflective bands are seen here with photographs of couples enmeshed in their webs. Intimate but constrained, they capture the strengths and complications of the social and the resoluteness of the personal as political. As Issa’s interventions and the Orta’s’ social sculptures reinstate degrees of personal agency, Li Mu and Praneet Soi’s subjects struggle in more extreme conditions. Rendered as large drawings painted black on white and white on black, Soi’s figures which are taken from media images of victims of terror, torture and war are deeply ambiguous. Sometimes appearing caught in sexual ecstasy and sometimes in the deepest distress, they are split, stretched and fragmented. Soi’s figures cleave together struggling to maintain some form of integrity and connection. Within the disciplinary spaces of a Shanghai juvenile reformatory Li Mu worked with offenders and around official strictures (the censoring of books) in his project Blued Books (2008-9) establishing a library of art books and scrapbooks that the inmates could borrow and use. Meeting monthly they discussed, played and drew and while Mu documents these interactions, it’s not about art making in the end but the possible emergence of fragile freedoms in this unaccommodating space. While the eyes of the portraits of Blued books are blanked out, their chosen books evade control becoming stand ins for identity. 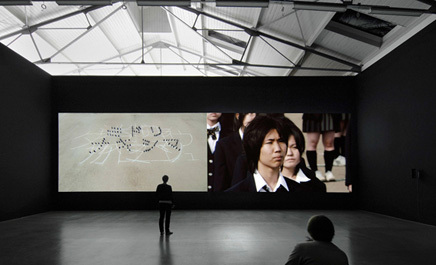 Maroan el Sani and Nina Fisher’s video diptych Spelling Dystopia (2008-9) plays with reality, history and fiction unsettling the history of a place that seems itself to have sprung from the collective cinematic imaginary. Two screens show views of the abandoned industrial site of Hashima Island. Resembling nothing less than a concrete battleship, spinning views of Hashima are intercut with scenes of Japanese schoolchildren spelling out phrases in formations to the shouted orders of an unseen authority. As the camera travels around the island’s derelict interiors, the memories of a previous inhabitant are set against schoolchildren’s recollections of the horror film Battle royale where children abandoned on an island are told to hunt each other to the death in an ultraviolent game. Running parallel, the fictional version seems infinitely more fitted to the island’s grim concrete fortifications than the benign memories and this uneasy vacillation between ‘truth’ and plausibility is never resolved. Rosella Biscotti’s The Sun Shines In Kievsimilarly plays with the instability of official histories and personal memory. As a slide show of film stills of Soviet soldiers progresses almost imperceptibly, the film shot by the first film crew allowed back into Chernobyl plays. Interviewees talk about the mysterious disappearance of reels of film, the fate of the director and the uncertainty of events at Chernobyl as the film is interrupted by stretches of black screen, white spots and the ticking of a Geiger counter. As the slide show breaks up all idea of narrative, the revelation that the ‘erasures’ are the physical traces of radiation, wiping out the film makes the constructions of history very evident and unstable to the point of collapse. While the works of Apart we are together are the in between, the uncertain and ambiguous the catalogue is very serious, neatly tying each work down to the curatorial theme with essays explicating each to the full. Yet this misses the fluidity and lightness of many of the works, Tara Donovan’s coffee cups beguile every gallery visitor, Morakot and Static electricity of the cats cradle are playful and charming and while Iman Issa’s works have a serious intention they also have a certain insouciance. So too, the Orta’s utility wear and Spelling dystopia possess a cool of ‘it’s the end of the world as we know it and I feel fine’ sort. Sometimes inexplicable and contradictory this incompleteness is the strength of Apart we are together. In feeling out ‘what defies description’ these works enact games of chance, reassert spaces of contention and possibility. Tied down too firmly, they’re robbed of the room to move and play. Chancy, fleeting and slippery, the works of Apart we are together have an unpin downable-ness that quietly suggests that the things that defy description are the ones most worth excavating. Saskia Sassen “Reading the city in a global digital age” in Urban Screens Reader Ed Scott McQuire, Institute of Network Cultures, Amsterdam, 2005. p35. Apart we are together, catalogue essay, Victoria Lynn, 2010.